Perhaps they were just too cute to be eaten. Or perhaps we had very high expectations. Perhaps we were all just too tired from a very exhausting week and needed some comfort food instead. Prep time was just too long for the mood we were in and by the time the squash was ready, any interest in how cute they were had all but dissipated. Perhaps I should have made them on another day when everyone was in higher spirits. I stuffed the sunburst squash and took pictures rather half-heartedly. The sunburst squash that I bought were small in size - between 2 to 3 inches in diameter. I wanted to preserve the scalloped edge so I sliced the top off one and then realized that I didn't have much space left for the stuffing. So for the rest of them, I just sliced off a little cap from inside the scalloped edge. They had been blanched before they were decapitated. I scooped out the inside, chopped it fine and mixed it with the stuffing. I sliced off the base so that the squash would hold its own weight. 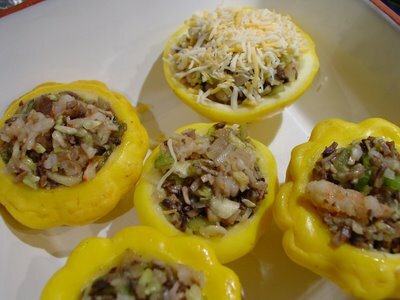 I then stuffed them with a filling made of lightly sautéed onions, finely sliced celery, finely chopped mushrooms, a finely minced clove of garlic, and finely chopped cooked shrimp with a dash of lemon and some chilli powder for some zest. I topped this off with Kraft's 4 cheese. And then put the caps back on after lightly buttering them. I covered the dish with foil and bunged it in the oven for at least half an hour. It may even have been 40 minutes. 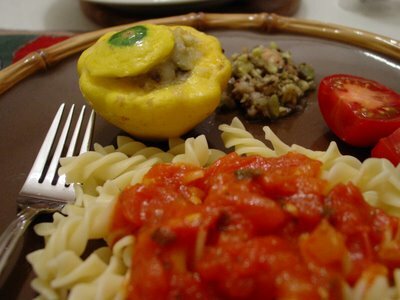 Unfortunately I served it with pasta smothered in Arrabiatta sauce, also known as the "angry sauce" and that overshadowed the subtle flavors in my stuffed squash. The Arrabiatta sauce stole the show. Like the squash, I found it at Wild Oats. If you haven't tried it yet then go out and get it! It's different. It's such a delightful change from the usual zugu. It's happening again: the Arrabiatta is getting the accolades instead of the sunburst squash! Thank you so much for your suggestions and ideas: Prita, Anupama, KrishnaArjuna, Mythili, Archana, Diane and Shilpa. I will definitely make this again. Next summer will be a great time to do so. We will have forgotten what went so wrong with this meal. You have a lovely blog - my first comment here. Incidentally, I got these veggies last week for the first time out of whim. The gentleman who sold them to said it was called Patty Pan. Didn't know they were also called Sunburst squash. Wasn't sure what to make with them, so I grilled a few and with the rest, I made koottu. I love the filling you've used. I'll try stuffing them like you did the next time I buy these. Wow !!! what a wonderful color looks delish !!! this is very good creative !! Faffer, welcome! It's great to have you here! Yes, these are also known as pattypan squash. 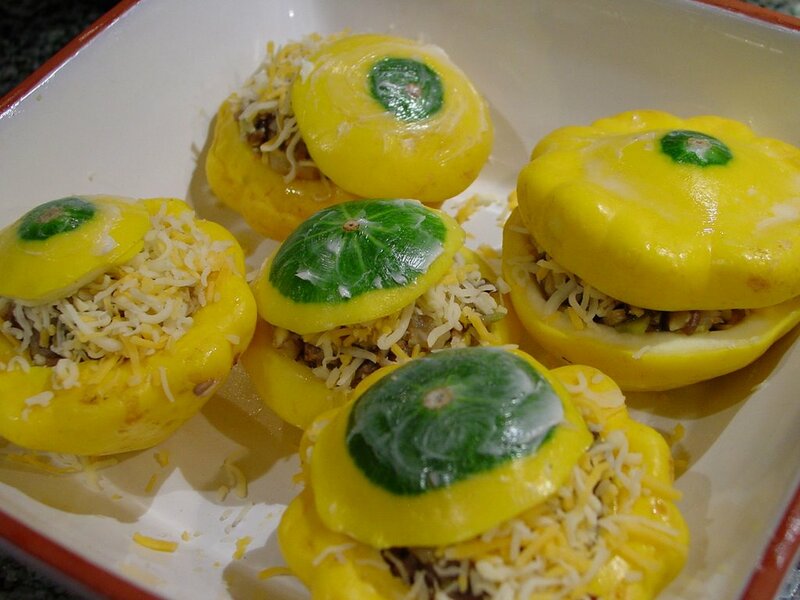 Pattypans come in yellow, green and white colors. 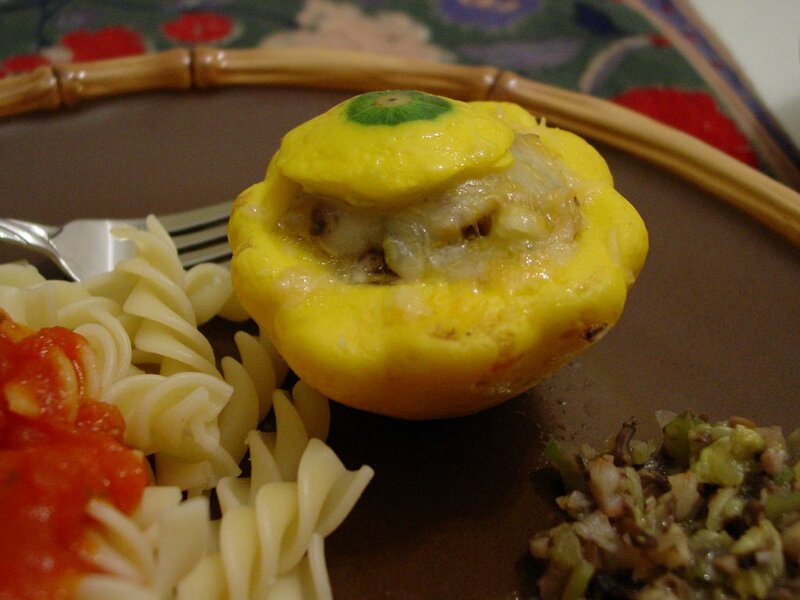 The yellow pattypan is called sunburst squash. The filling I made was very good. I made too much so I served it along with the squash. Let me know if you try this or do something else. I'd love to try these again some time later. 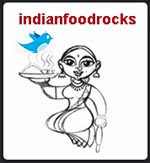 Revathi, I have heard it said that as long as it looks good in a picture who cares what it really tastes like. Well, this looked good, it tasted good - we just weren't in the right mood for it. Which is the really sad part. Manisha, I was about to mail you today to ask what you did with those squashes :D. Happy that you posted them. I am going to try it soon. thanks. Hey..lovely entry for the folwer fest. 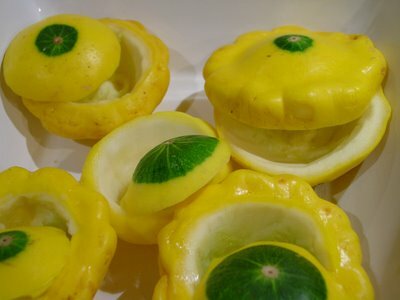 Hi Manisha ~ too bad you weren't in the mood, for pattypan are really nice! I posted stuffed ones AND baby ones last week. I love the name sunburst though, is that what Whole Foods called them? Shilpa, let me know if you do. I don't know if you will still get these squash since they are summer squash. AK, I looked for stuffed pattypan squash on your blog but couldn't find the recipes. Could you post the URL here if possible? I bought these at Wild Oats and yes, that was what they called them. If you scroll down on this page, you will find that they are called sunburst squash there, too. My friend took one look at the picture I sent her and said those are pattypans! Thanks for sharing! Hans and I have been looking for creative ways to cook the recent influx of squash from the farm. 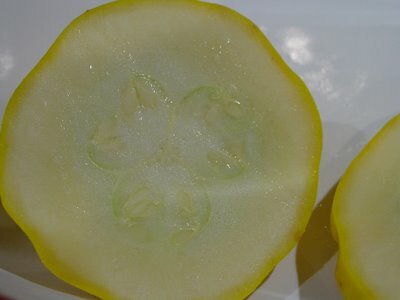 We've started getting some beautiful white pattypans, and we love Indian flavors (check out our "Las Cruces Dal" entry), so this is something we just might have to try. I just made this today and it was really delicious. I made a few minor changes; I omitted the cheese, shrimp and lemon and added fresh thyme and white wine instead. I think Parmesan would be quite fitting if you felt like adding cheese back in.